This was totally an impulse buy when I laid eyes on it. Emio did a great job in recreating the NES Advantage. 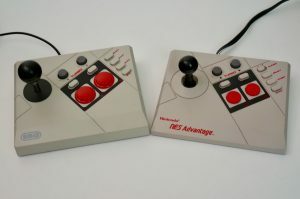 I loved my NES Advantage when I was a kid. I was hoping that this would let me relive the ways that I actually played my games. I do still in fact, own my NES Advantage. I pull it out for comparison in the video portion of this review. This joystick can be used with the NES Classic or Wii U Virtual Console games. 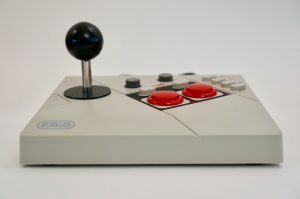 The joystick features an 8-way input. You can hear the clicks as you rotate it. 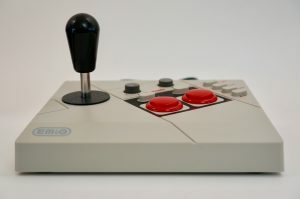 Standard Start and Select buttons are here as well as a “Slow” button, which is really a turbo version of the Start button. It won’t really be slow in some games as Start brings may up a menu rather than pausing. There’s a mini guide that covers the 30 games on the NES Classic. It is written in both English and French. I found this to be a neat little addition. Packaged with this joystick is an extra joystick grip to fit your playing style. Although I am used to the taller teardrop style when playing fighting games. I will stick with the ball that I know from 8-Bit gaming. Only after I got this did I realize that there was an issue with the initial batch of The Edge Joystick. They didn’t work properly when plugged into the NES Classic. The fix came in the form of an adapter. Luckily I didn’t impulse buy this back then. The Edge Joystick is made with lightweight plastic. The joystick feels very sturdy and will take tons of beating. All of the buttons and knobs feel great as well. It doesn’t feel like EMiO skimped on the construction of this. It feels very sturdy for how light it is. I might just be biased because I am used to the heft of the NES Advantage. They could have added artificial weight to give it that heft. 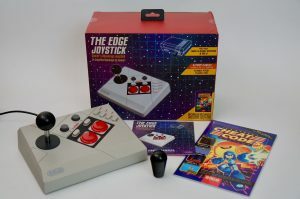 The Edge Joystick is a great peripheral for the NES Classic and Wii U. It does a great job of emulating the NES Advantage and the feature set it was modeled after. The Joystick feels solid. The buttons are responsive. I played many of the NES Classic games with no problems. Level 1-1 of Super Mario Bros. is a great warm up. I finished it without dying. I played through a level of Megaman 2. Megaman is a game that need precise controls and proper timing. No problem there at all. 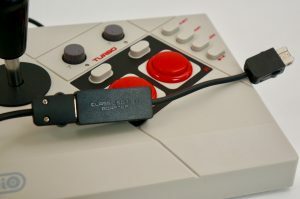 I didn’t think I would need an accessory for the NES Classic other than a second controller, but I think I’ll take this and make it my Player 1 Controller instead and relegate the NES Gamepad to player 2.